On 19th Sept, Nikon and Fujifilm both are going to announce their new flagship DSLRs in India, also Canon will announce its next device on 21st Sept. The global camera market is declining year-by-year, however, the dip majorly in the pocket or compact digital camera segment is huge and DSLR market seems promising. The smartphone revolution has affected the camera market a lot, as we all know smartphones’ capabilities and now these phones have Dual camera setup as well as expecting to get a quad camera soon. These developments can affect more on the digital camera market. The CIPA research shows the stats about the growth in the industry as well as the dip. Since 2010, the sale started falling for the camera industry. In 2005 Google bought Android Inc and introduces smartphones with the OS in 2007, however Blackberry and Apple was already there with their devices on the market, but Android changes the game. And same we can see in the graph, as more people turned to smartphones, Samsung and other major players started adding better features and greater cameras to the devices. Resulting in continuous sale decline in the digital camera space. Still, we can’t ignore the DSLR capabilities, because nothing can replace it, till now whatever mobile manufacturer say, the quality of shots we can capture with a DSLR can’t be done by any of the smartphones. 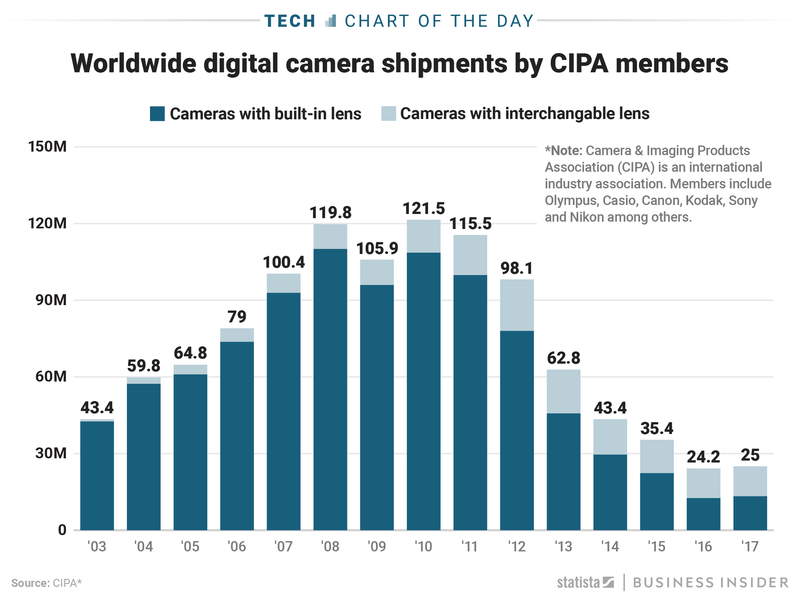 The graph also simulates the same, as you can see the loss in the digital camera segment, yet the DSLR or interchangeable lens cameras have almost similar market share throughout the decade. there are small changes in the sale yet it is not much unstable. Nikon and Fujifilm are about to bring their next mirrorless camera range tomorrow. Fujifilm adds a new member to its ‘X’ series, on the other hand, Nikon would announce Z Series Mirrorless Category. If we go by rumours, Fujifilm could announce its “X-T3” that uses the X-Processor 4, an evolved version of X Series’ image processing engine that boasts advanced processing capabilities. The new processor, combined with a new algorithm, enhances the Film Simulation modes, substantially improving the camera’s ability to track moving subjects, boosts AF’s speed and accuracy, and allows for a more diverse range of video functions. It maximizes the full potential of X-Trans C.
Nikon Z series 6 and 7 cameras are already in the market and tomorrow more devices will be added in the lineup. The month of September is going to be a great month for camera enthusiasts, just keep your eyes wide open. Will Nikon, Fujifilm and Canon Take-up the Dangling Camera Market 3.3333333333333 out of 5 based on 3 ratings. 3 user reviews.